Scones are one of my favorite things to bake. They can be dressed up in so many ways, with fruit and chocolate or even cheese and formed into all kinds of shapes. 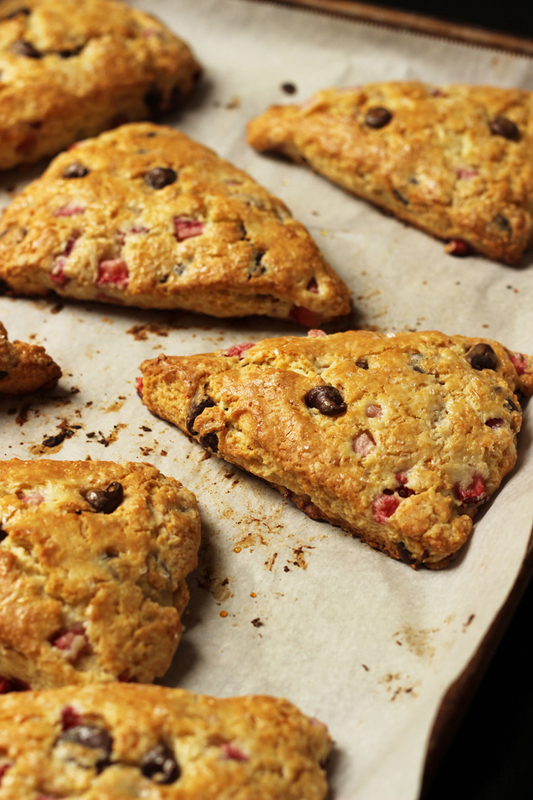 Enjoy the bounty of spring in these delicate Chocolate Strawberry Scones. 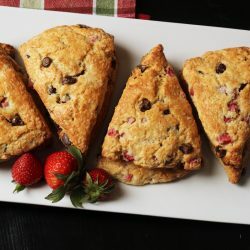 Bits of rich chocolate and sweet-tart strawberries add flavor and texture to these classic cream scones. Do you remember the first time you had a scone? For my friend Gale, who grew up in Northern Ireland and pronounces it scawn, it was likely before her first birthday. For me it was college. Scones were not a part of my 1980s childhood in the suburbs of Los Angeles. We didn’t have fancy pants bakeries back then or — gasp — even Starbucks. I don’t remember having a scone until college, and then? Then it was love at first site. Scones are one of my favorite things to bake. They can be dressed up in so many ways, with fruit and chocolate or even cheese and formed into all kinds of shapes. Scones are very make-ahead and extremely freezer friendly. My scone mania knows no bounds. I had to hold myself back when I was writing the freezer cookbook. There are FOUR scone recipes tucked within its pages and TEN more here on the site! Baking scones is not a difficult task. It’s a quick dough, without yeast for leavening, so you can mix and assemble your scones in a matter of minutes. The process is a bit floury as you spread the dough and cut it, but even I — who hates getting my hands messy with dough — can handle the process. 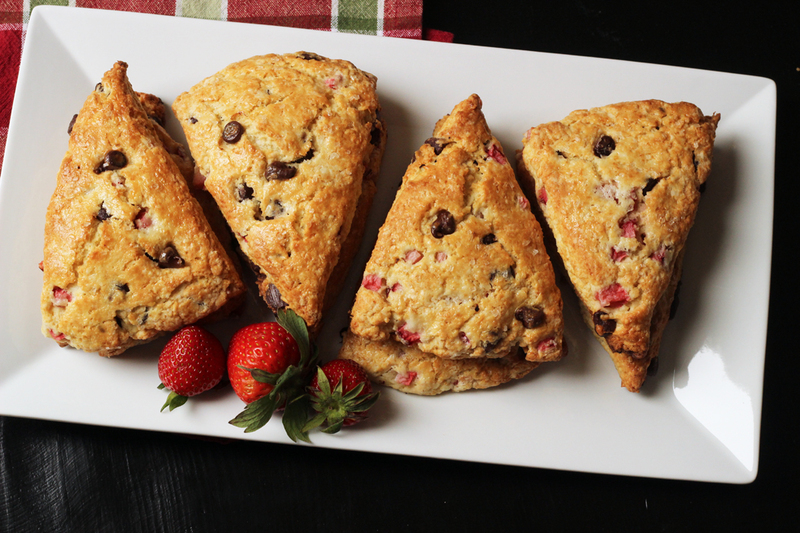 And when you’re baking a batch of these Chocolate Strawberry Scones? The effort is totally worth it. Necessity is the mother of invention, they say. That certainly is true in the kitchen when you’ve got fresh fruit in abundance. Spring is here and as such, we will be seeing crazy sales on fresh strawberries. They’ve been as low as $0.69/pound in my neck of the woods, so I stock up whenever I see a great price! And don’t worry, you can always freeze your berries if you end up buying too many! Strawberries are delicious for eating fresh. Who needs another way to eat them really? However, strawberries are a fickle fruit, particularly when you buy 12 pounds. Ahem. They will go “off” rather quickly leaving you with sad, dull looking berries (at best) or fuzzy little science projects (at worst). It’s not a deal unless you find some great ways to use your strawberries. You can make Strawberry Salsa or Strawberry and Chocolate Icebox Cakes when the berries are still at their prime. Move toward blending them into Strawberry Chocolate Chip Ice Cream, Strawberry Lemonade, or Strawberry Mango Smoothie with Banana when they start to sag. 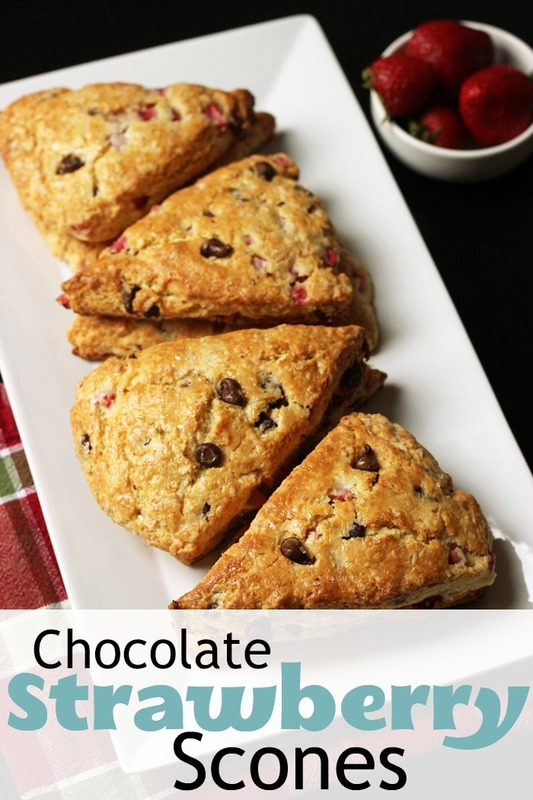 Or bake them into these Chocolate Strawberry Scones! You don’t often see fresh strawberries baked into things. Their high juice content and mush-potential often gets in the way of that. However, I’ve found that if you dice the berries finely, they work very well in strawberry scones or their cousin, the Strawberry Oatcake. It’s a modified version of a classic cream scone recipe from Fine Cooking. I’ve reduced the amount of cream as well as swapped a whole egg for the two yolks. I do not want to worry about what to do with two egg whites! Stock up on ingredients when they are on sale. When I find regular kitchen staples on sale, I buy a lot. I’m currently using a price book to track prices and that’s saving me money. For this recipe, keeping an eye on the price of flour, butter, and chocolate can help keep the price down. And of course, stock up on strawberries when they’re at a great price! You can check out all my strategies too for stashing that beautiful seasonal produce in your freezer. Buying in bulk – It’s rare that I would buy a small amount of chocolate chips. In a household with 8 people, you know your solo bag of chocolate chips doesn’t stand a chance of being there when you need it. I hedge my bets by buying in bulk. I also have gotten into the habit of buying cases of flour from Bob’s Red Mill or VitaCost so that I always have baking supplies on hand. One of the great things about scones is that you can freeze them before or after baking. If you freeze them prior to baking, you don’t have to thaw them at baking time; just slide the frozen scones into the hot oven and add a few minutes to the baking time. If you bake them first and then cool and freeze, you can very easily thaw them overnight on the counter so they’re ready when you are. food processor or pastry blender – Either of these tools make quick work of the short dough. You can do it by hand with two knives, but I prefer my food processor. bench knife – I love this tool for easily cutting dough into pieces. 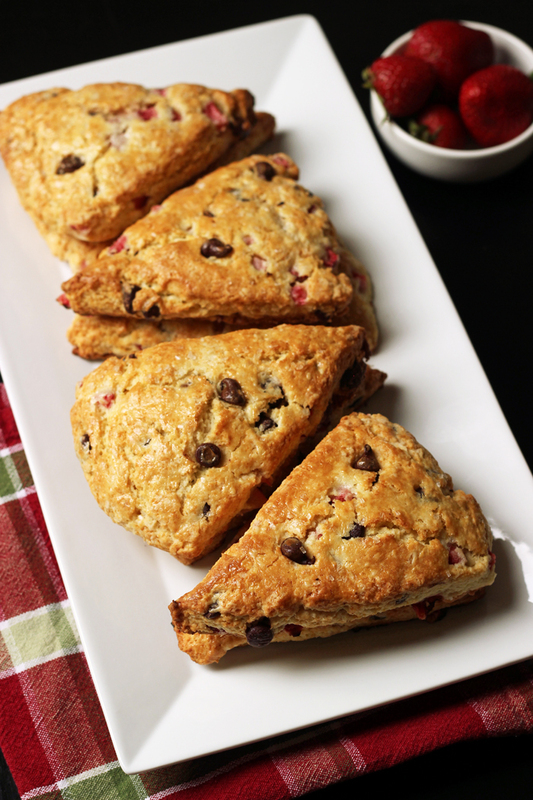 Enjoy the bounty of spring in these delicate Chocolate Strawberry Scones. Bits of rich chocolate and sweet-tart strawberries add flavor and texture to these classic cream scones. Preheat the oven to 400 F. Line a sheet pan with parchment paper or a silpat baking mat. Empty the dry mixture into a large mixing bowl. 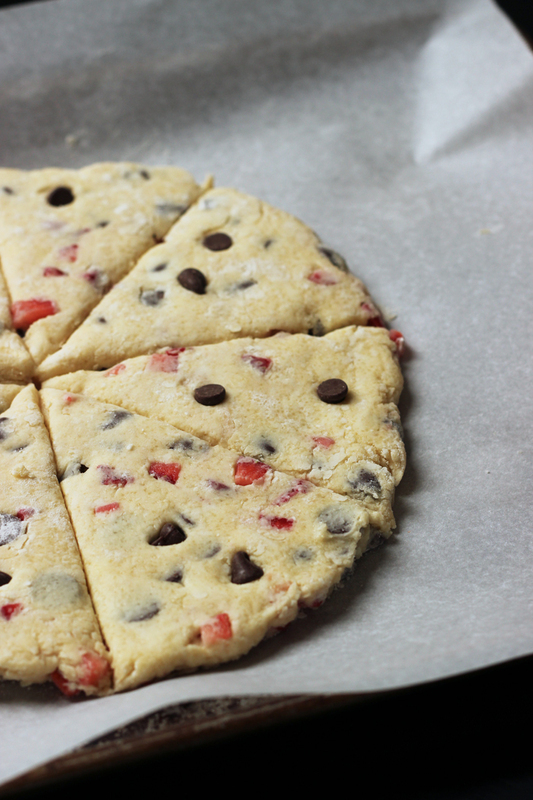 Add the chocolate chips and diced berries. Toss to combine. In the now empty processor bowl (no need to wash) add the cream and egg. Blend well. Add the wet mixture to the dry and fold to combine, just until mixed. Turn the mixture out onto a floured surface. Knead a few times just until everything holds together. Pat the dough into a large circle about nine inches in diameter. Cut the dough into eight wedges. Separate the wedges and place on prepared pan. Brush with some cream and sprinkle with sugar. Bake 18 to 20 minutes or until tester comes out clean. Cool on rack before serving. You can also freeze the scones, baked or unbaked. Flash freeze unbaked scones on a lined tray. Once they are hard, transfer the frozen scones to an airtight container and store in the freezer. When ready to bake, place the frozen scones on a baking sheet as directed in the recipe. Increase the baking time about 5 minutes. Alternatively, store baked and cooled scones in an airtight container in the freezer. Originally published July 10, 2009. My 14yo son just baked up a batch of these (98% on his own). Well, he left out the strawberries and upped the cream a bit since he figured the moisture would be effected. He can do them with strawberries next month when they will be in season. We had a small amount as an after- afternoon snack as we lacked the willpower to wait until after dinner. Mmmmm. Off to go finish preparing a healthy dinner so we can have more for dessert. Another positive of having a teen in the house! @Carla, wise boy! So glad you liked them. I’m so glad you liked them! As for strawberries, my kids could eat them all. If it’s a really good deal, I freeze them for smoothies. Do you know how to adapt the recipe to use all white whole wheat? Whole wheat is a little more absorbent, so I’d add about 2 tablespoons less and then adjust as needed. Should be yummy!